For use with Pre-metalized Acid Dyes, which are notoriously hard to dye evenly with, on silk and wool to level (make even) these dyes by making them strike more slowly before "fixing" the dye with vinegar or citric acid. For a list of which of the Dharma Acid Dyes are Pre-metalized, see the blue section under the Instructions Tab on the Dharma Acid Dyes web page here. 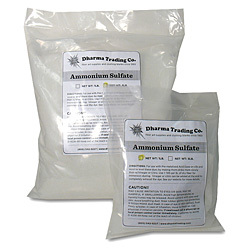 Use 1 Tablespoon of Ammonium Sulfate per lb. of dry fabric for immersion dyeing. Even though this salt does release a mild acid as the dye bath progresses, Vinegar or citric acid should be added at the end to completely exhaust the dye. I love ammonium sulfate! I just add a tablespoon to the dye bath before I add the fiber then gradually raise the temperature of the dye solutionfiber to boiling. This technique really helps to level the tricky pre-metalized acid dyes. No more blotchy colors on my wool! Seems to do what it's supposed to do. I wish I had bought a bigger bag! !